Heads of states from around the world are currently in Paris for climate action negotiations to arrest a dangerous rise in global temperatures. The two-week-long Conference of Parties (COP 21) started on November 30. India is expected to be one of the countries worst hit by climate change and, hence, the deliberations in Paris are crucial. Weather systems are undergoing a change in India and the proof can be seen in increasingly frequent installments of extreme weather events. 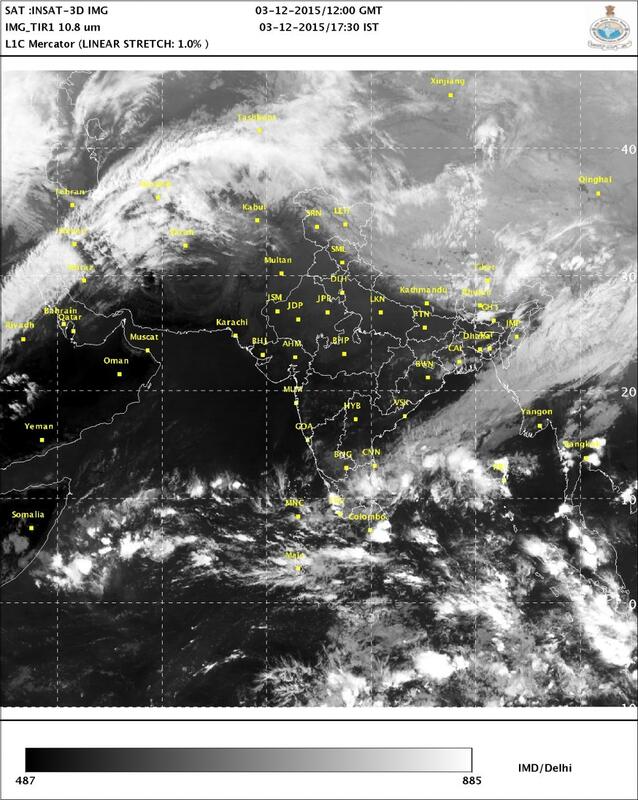 This time, it is the northeast monsoon, which is responsible for winter rains over peninsular India and Sri Lanka. This year, the northeast monsoon has hit southern India with full force. Northern and coastal Tamil Nadu, southeastern Karnataka and the Rayalseema region of southern Andhra Pradesh have all been battered by sustained rainfall. Longstanding records for daily rainfall levels and monthly rainfall for November have been broken in both Bengaluru and Chennai. Between October and the last week of November, three of the four districts in Rayalseema, 11 of the 16 in southern Karnataka and all but eight of the 33 districts in Tamil Nadu and Puducherry have breached 10 per cent excesses with several districts registering even more than twice the normal. While 3-4 days of heavy rainfall and long dry spells are common, this year, the rain has continued with practically no respite for almost a month now. While heavy rains have lashed parts of all three states, the rain-receiving regions are well-defined and isolated with scanty and below-normal rainfall in all surrounding regions. Interestingly, almost the entire region, which is now struggling to cope with excess rains, received below normal rainfall during the summer monsoon and was staring at water shortages and droughts. In recent years, the shifting patterns of the Indian monsoon (southwest monsoon) and its implications have been spoken about extensively, but the northeast monsoon has, by and large, escaped scrutiny. The northeast monsoon has been considered a fringe player in the traditional telling of the Indian climate story. Known to bring a few heavy showers amidst scanty rains to the southern states, the winter monsoon in India has flown under the radar for most of its course. In recent years though, the winter rains are stepping out of anonymity and making their presence felt. The northeast monsoons are caused by retreating monsoon winds that attain moisture from the Bay of Bengal on their way back south from the northeastern region of India. This moisture is responsible for the rains in coastal and southern Andhra Pradesh, Tamil Nadu and parts of Karnataka when the retreating winds move back onto the peninsula between October and December. The El Niño Southern Oscillation (ENSO), responsible for decadal differential warming in the Pacific Ocean, has been known to impact several weather patterns across the world. Warming due to El Niño is typically characterised by a warm tongue extending westwards from the Eastern Pacific (close to South America). El Niño this year has been the severest ever recorded partly due to the warming of oceans due to global warming phenomena. Warming due to ENSO has been noticed not only in the Pacific Ocean but even in eastern Indian Ocean. The warming affects both the moisture uptake of the winds as well as the path that winds take. In effect, this means the El Niño has an important say in when and where it will rain. Several studies since early 2000s have pointed to a positive correlation between the ENSO and the northeastern monsoon. The unanticipated excessive rains are more evidence pointing to the same trend. The correlation with ENSO is not the only newly emerging pattern regarding the northeastern monsoon. A look at the seasonal rainfall levels in recent decades across districts in coastal Andhra Pradesh, Karnataka and Tamil Nadu reveals that the northeastern monsoon has become progressively more bountiful. A study, in journal Theoretical and Applied Climatology in 2012, makes use of homogenous rain gauge data maintained by the Indian Institute of Tropical Meteorology (IITM), to show that winter rains in peninsular India have exhibited a positive rainfall trend of 0.4 mm per day per decade between 1979 and 2010. At the same time, an increase in the number of extreme rainfall days and a decrease of normal rain days have also been observed in several parts of south India. Climate change is not just affecting the southwest monsoons and India’s rainy season, but is also driving changes in the northeastern monsoons. And if the near-constant flooding in southern states is anything to go by, the country needs to really up its game when it comes to anticipating, preparing and adapting to wet and dry spells of increasing intensity. Northeast Monsoon rainfall follow the opposite pattern to southwest monsoon,though both present a 56 year cycle. The Bay of Bengal cyclonic activity follow the northeast monsoon. This year rainfall is a repetion of the past and nothing is new. IMD has data since 1871, you please look at that data series before blindly attributing to global warming!!! I want ask the author of the report one simple question: when you say climate change, you mean global warming or natural variations and human-induced variations that include ecological changes?